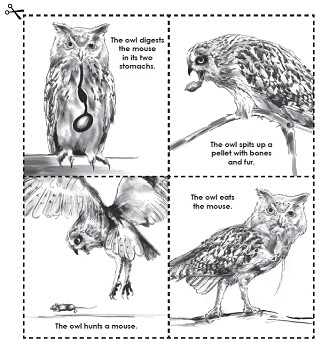 These printable worksheet can help students with their owl pellet dissection projects. You'll find a bone identification chart, a sequencing activity, and a reading comprehension passage about owls. You'll find other owl-themed worksheets on this page as well. 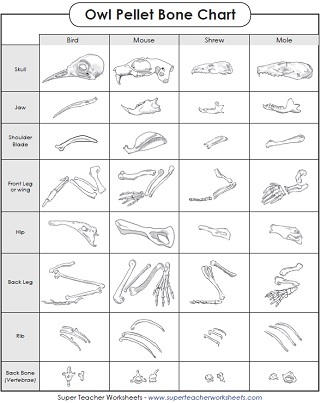 This chart can help students identify the bones they find when they dissect an owl pellet. Includes bird, mouse, mole, and shrew. This file includes an article for kids, as well as teacher notes. Discover how to obtain and dissect owl pellets to learn about food chains and animal anatomy. Learn how an owl pellet is formed. Put the events in order, from first to last. This printable owl pellet chart shows a rodent skeleton, with close up pictures of each bone type. Identify bones on a shrew skeleton with this bone identification illustration. This printable has a picture of a mole's skeleton. When dissecting owl pellets, students can match up the bones to build their own mole skeleton. See the bones that make up a bird's skeleton. This can be used as a bone identification chart for an owl pellet activity. Solve the basic addition problems. The color according to the key at the bottom of the page. All addition problems have addends between 1 and 12. Find the difference for each basic subtraction fact. Then color according to the key to reveal a brown owl. All subtraction problems have differences within 20. Solve each basic multiplication fact on the puzzle. Then color each space according to the key at the bottom. All multiplication facts are within 100. Find the quotient for each basic division fact shown. Then color according to the key at the bottom. Simplify each fraction on the worksheet. Then color according to the key. Round each two-digit number to the nearest ten. The color according to the key to see a picture of a brown owl. This non-fiction article about owls describes how they're adapted for nighttime hunting. Includes a page of reading comprehension questions, a vocabulary activity, and a writing prompt. This non-fiction passage describes several nocturnal animals, such as owls, raccoons, and bats. Includes comprehension questions, a vocabulary activity, and a writing prompt. Learn how animals use camouflage to help them hide and hunt. 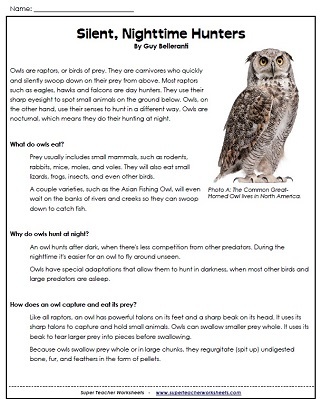 This article helps students understand camouflage in owls, snakes, insects, and mammals. Olivia needs a great idea for her school's pumpkin decorating contest. Will a mysterious owl in her yard be the good luck she needs for her project? Plot the ordered pairs on the grid to reveal a mystery picture of an owl. Learn how energy is passed through the food chain. Worksheets cover producers/consumers, carnivores/herbivores/omnivores, and predator/prey relationships.